Basically our trip started with a wicked long drive. Kyle has yet to go on a long trip (other than the trip home from the breeder's). 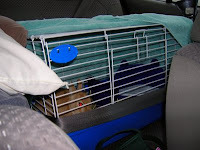 I purchased a "traveling" cage, one with a hard bottom and with sides so he could have hay and not make my car too messy. So much for that... I have sooo much hay in my car (and bunny fur will be flying out of my car vents for life). I ended up seat belting him in the back seat. As you can see he didn't like driving. I don't think he's much of a traveling bunny. 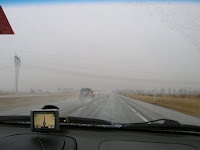 We had GREAT weather - we started with rain and fog. Then ended with snow and ice. Ice, mountains and driving fast don't mix, just as an FYI. The weather advisory stations kept saying to stay indoors and stay off roads because an ice storm was going to hit overnight. Mind you we are driving through the Appalachians. It was slow traveling. And on top of the weather, it took us longer because the bunny diva wouldn't eat or drink while the car was making that scary sound. You know, the sound of a car running. So we had to stop every couple hours, shut the car off and only then would the diva eat and drink. Because of the slow driving we ended up having to spend the night in PA. The bad asses that we are, we snuck Kyle into the hotel (shhh!). 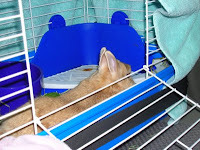 I figured that since he stayed in his cage all night it was all good. After a good night sleep, we woke up, had the free breakfast and let the temps outside warm up and made our way to New England. A little bit of fog, but the second day was a quick travel home. 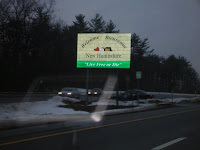 Notice the state trooper ready to get people just as they enter NH; gotta love it.